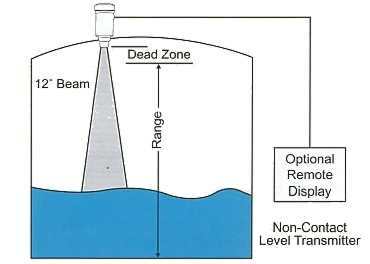 The Babbitt ABM Series Ultrasonic Level Transmitter allows simple and reliable non-contact level measurement of fluids in a tank, sump or other container. The microprocessor-controlled circuit generates a pulse that is transmitted from the transducer face. This pulse is reflected back from the surface of the liquid. The "round trip" transit time is then converted into the current output, which is directly proportional to the fluid level. The circuit automatically filters out false echoes that may be produced by peripheral obstructions in the tank. For example, a pipe or ladder that is in the "ultrasonic cone" (but not directly in front of the transducer's face) will be ignored; the ABM Series has a proprietary circuit that locks onto the farthest echo which will always be the fluid level. The current output (4-20mA) can power a load of up to 750 ohms. The Factory can supply digital readouts with optional setpoints for self-contained alarm/control systems. 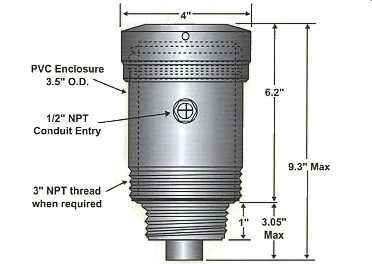 A single push-button is used to set the point for 4mA and 20mA. The output may be either proportional (elevation) (4-20mA with zero=4mA at the bottom of the tank) or inversely proportional (depth) (20-4mA with 4mA=zero at the top of the tank). The 4mA and 20mA points are independent and fully adjustable over the span of the unit. Feedback for the calibration procedure is provided via a "green-yellow-red" LED. The calibration settings are stored in non-volatile memory, so the unit stays calibrated even during loss of power.